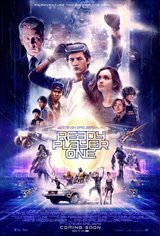 I would rate this movie 4 1/2 stars because the this is a fantastic movie with a lot of fun to be had and a great soundtrack with great CGI that works with this action/adventure movi3 wi5h great elements with the gaming world. I would recommend watching this movie if you are familiar with 80s nostalgia and games in general. I loved this movie, good graphics and story! It's this year's Star Wars! coolest movie I have seen in a very long time! I will gift you good review rate ready player one I will be back to see soon. A great movie from the master of wonders movie. He always nails down some childhood issues than makes you wonder. An entertaining movie that plods at times and is over-long. Just when one feels like they are just watching a video game, the movie thankfully pulls the viewer back into reality or changes things up with a romp through a familiar old horror movie. The romantic writing is cringe-worthy and one wonders why Spielberg even tries at this, he is so awful at it. If you gamed in the 80's and / or enjoy Spielberg (and Kubrick) you will enjoy the plentiful references. Do not go in looking for any sense of reality or believability. Having read the book multiple times, I was very much looking forward to this movie. The book is a must read for anyone that grew up with 80's geek pop culture and rise of gaming. The movie does the same but mixes in some newer elements as well, clearly trying to reach a wider audience. This is why I did not enjoy the movie as much as I did the book. The story was kept the same at a very high level. However, all the challenges, situations, character building etc was different. Still a decent story, not nearly as captivating however as the book. Worth watching as a story in the same universe/setting but not the story you may have read. I don’t have a clue about gaming but this movie about gaming characters was fantastic. Loved it, even though I'm not a gamer! Great story and action! I think this movie appeals to all ages. Shows us old ones how one can get caught up in gaming. I really enjoyed this movie! Great animation! it was so awesome! Get ready because you are going to just LOVE this movie! Just saw this film. I am so sorry I spent the time and money to see this. Very disappointed. Obviously an animated teen flick. Computerized, computerized computerized --animated. Poor story line and you don't have any feelings or care about the principal players. The supposedly "funny" parts were not funny-no one was laughing in the theater. I almost fell asleep (just read some of the reviews in which others did too--wish I had read those reviews before I spent my time and money) half way through & I ended up walking out. What a waste. I never read the book so I don’t know how much this movie followed exactly the book story but this movie was interesting. The avatars from people who wanted to be some in a virtual reality world, but they still kept their truly human feelings. Good movie to watch. meh. I almost walked out because I wasn't interested in seeing an animated feature. But I stayed. The live action story came to life later, and in the end there was a cool looking battle. Ultimately, the stakes are not high enough for me. Some dude wants to rule a VR world? Who gives a...? This movie give me chills. lol I downloaded some of the music by iTunes and some of songs are soundly little similar to Back to the Future. I loved this movie. Brought me good memories from my childhood. Steven Spielberg's film are very weird and magically. The child we have inside of us and wants at times to go out and play. He knows how to make sweet movies with a touch of controversy issues. I really enjoyed this movie. Movie was super fantastic. I don’t play video games but I liked this type of movie. The book, the film, and the experience of watching Ready Player One was dazzling. Our real world is cynical, but this film is optimistic, fun, and truly mesmerizing. I always wanted to be a writer, but after seeing this film, I shall take my strides and be one. Steven Spielberg's film ignited something I had forgotten to see within myself: infinite potential. Steven Spielberg’ you nailed this movie and blew my expectations away. I had a pretty good idea to what this movie was about but as I kept watching it started to exceed my expectations. I will go see again for sure. It was that entertaining. A must watch.